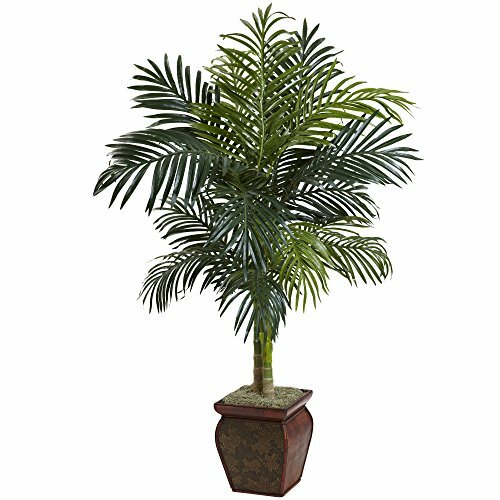 Artificial palm trees can wonderfully bring the beauty of palm trees into your home. But one of the benefit of faux trees is that you don't have to administer the care that real trees need. No watering, no sun needs and no dirt. And the varieties in these trees is amazing. They can range in height from 10 inches to 7 feet tall. Most of these curated options have their own pot so not having to search for a pot is another benefit of having a fake tree. Of course you do want to dust your tree and clear it of spider webs from time to time. 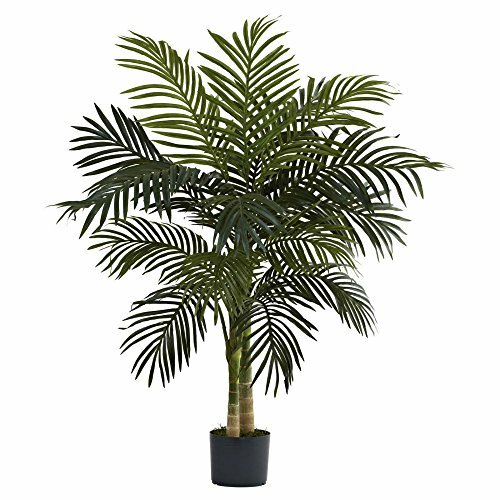 Feel free to peruse the different faux indoor palm trees we've found and enhance your space. Dimensions: 36W x 12D x 64H in. When you think about the world, about Earth and Universe and about life in general, which is the first image that your mind projects? For many people, it would be the image of a green plant, often the image of a tree. The answer, according to psychology, is extremely simple. The green leaves are associated with life, while the roots of trees also have a mythological signification for life and world. Therefore, what other proof do you need, in order to accept the truth that trees are some of the most beautiful elements around us? More than being the most representative elements for life, health, happiness and prosperity, plants and trees are the ones that add beauty to the world around us, from gardens and farms to forests, natural reservation, parks, streets, yards and more. They are the most tangible proof of life! Some of the most beautiful trees in the world are the Japanese Maple trees, which have inspired hundreds of artists to paint or write sensible, touching poetry and songs. But equally fascinating are the Cannonball Trees, as well as the Palm Trees, which are a very special species of trees for people, coming in multiple shapes and variations, as the most popular symbol of vacation, sun, summer, sea and beauty. Let's be honest, when you see a palm-tree, your mind immediately brings your thoughts to a relaxing, comfortable hammock between two palm trees on the golden sand from the beach, next to the blue sea, under the hot sun. And this is exactly what makes palm trees do special and enjoyable for people! To bring beauty home, many people decide to enhance their homes with the most beautiful, apart and fascinating indoor trees, flowers and other indoor plants. From simple cactuses to pretentious flowers and to sophisticated indoor trees, people bring all sorts of beautiful plants into their homes, for a comfortable, relaxing and natural home environment. 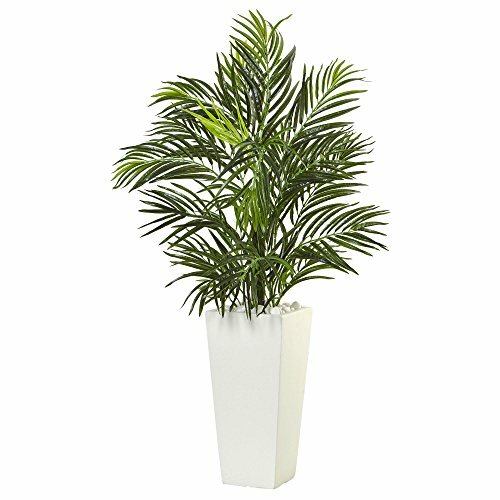 Besides, more than offering a comforting visual atmosphere, more than adding color to the room and more than becoming a design piece of your home, indoor plants are also an important element for the quality of the air in your house, generating a considerable amount of welcome oxygen, which is extremely beneficial for rooms, bedrooms, halls and even offices and living rooms. Moreover, with so many health and aesthetic roles, plants become part of your home and family, having an incredible psychological impact, too. For all people, especially for those allergic to pets, plants might even become their best friends. 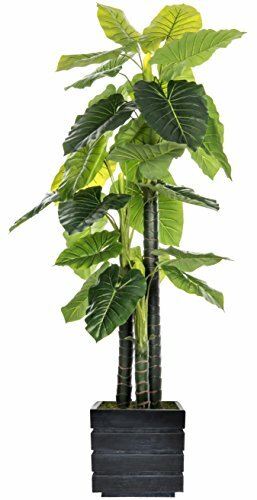 There are so many people who talk to their plants or who absorb their every day positive energy from their plants, watching them grow more and more beautiful as a soul therapy - this offers a fundamental importance to plants in any home! Are Natural Plants at Home Such a Great Idea For Everyone? Though beautiful, real trees do require a lot of care. You need to stay up to date and to know how to care for your trees, otherwise you will lose them - because they are alive, and without proper care, they will die. After you grow attached to them, losing them will definitely make you sad and will leave an empty place in your heart and memories. It's not only that you have to regularly feed them with water and special plant food. Caring for a plant means so much more. It means changing the potting soil whenever needed, it means knowing how to cut the right leaves at the right moment, it means a good knowledge about parasite prevention and it means knowing everything about your plants' needs: light, wetness, position etc. Now, while there are many people passionate about gardening, the truth is that not everyone is good at caring for living plants - some people do have a black thumb and don't succeed in keeping plants alive. Moreover, imagine that you buy an extremely beautiful tree, with superb leaves and colors, but due to your stressful lifestyle, you forget or don't have enough time to take proper care of it - and it dies. Wouldn't you feel so sorry for not being able to keep that plant alive? The situation above is something common that happened to many people, even though they were true plant lovers. And this is why they came up with the most logical and efficient solution for everyone: artificial plants! Since the 1980s, people have understood that while almost everyone loves plants, not all the people know how to care for one. And they started to create artificial plants. 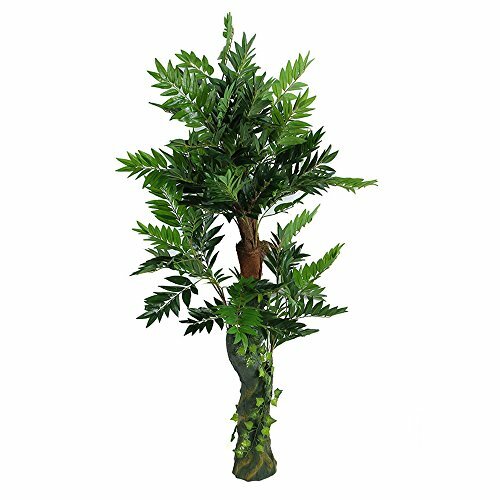 As years passed by and the technology developed, today there are very specialized artists who create the most beautiful, realistic, natural-looking artificial plants and trees that people can buy in order to add natural beauty to their home. 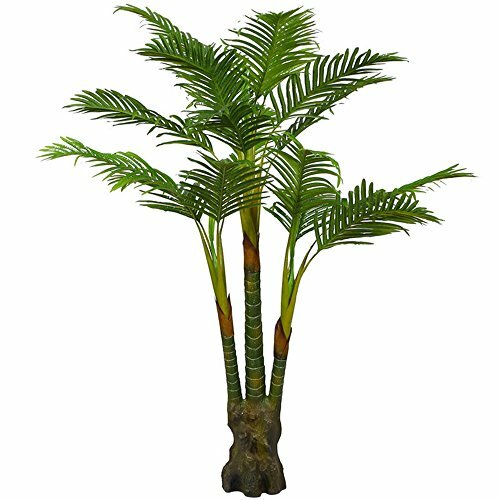 And as you will see, even though you love maple trees or palm trees (which you can find in various designs, dimensions and types on our website), due to specialized technology, all these fake indoor trees look real and will be perfect for your home, in order to remind you of nature, beauty, relaxing vacations etc. Some people like admiring the beauty of having fake hanging plants, while others prefer smaller artificial plants such as tiny flowers imitating the real ones perfectly. 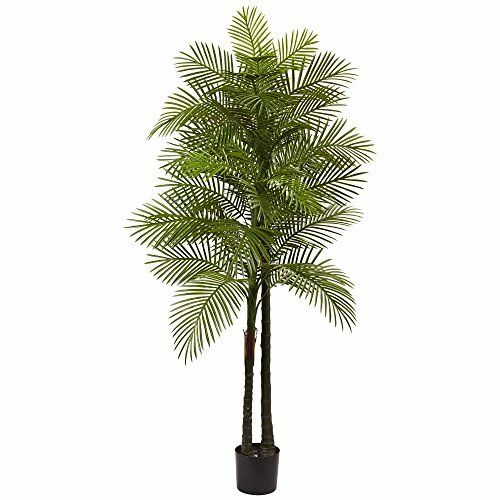 And others love trees in different dimensions, because artificial indoor trees are some of the most alive and attractive elements of a home. 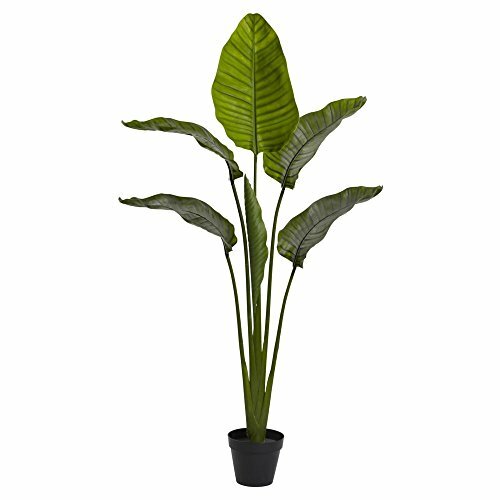 These artificial plants come in nylon, paper, clay, polyester, plastic or even silk versions, combining materials and colors for the most realistic results. Apart from real trees which need unconditional attention from you, artificial trees are a lot easier to maintain clean and healthy-looking. 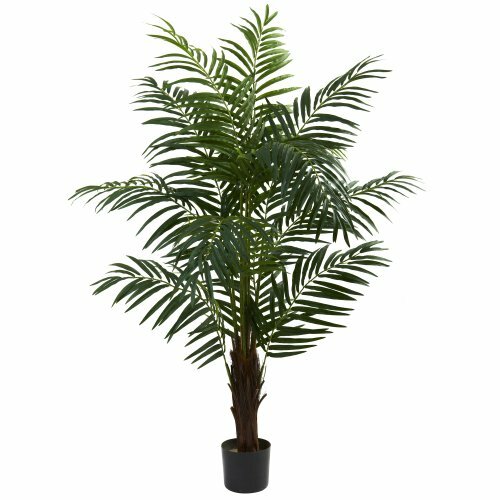 With artificial trees, you won't have a problem with the need of wetness, coolness or darkness that forces you to keep the plant away from the window and from the sunlight. 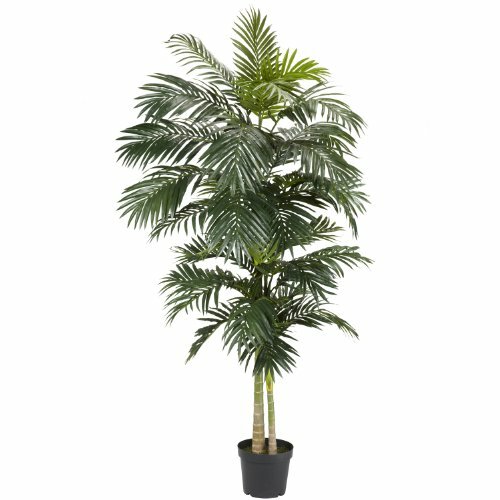 Also, you won't face any seasonal changes in the color, structure or appearance of your fake trees. And, of course, your home economy will be untouched by artificial plants, because they don't need natural supplies of light, water, heat, food or pesticides. Minimal space is all they need! 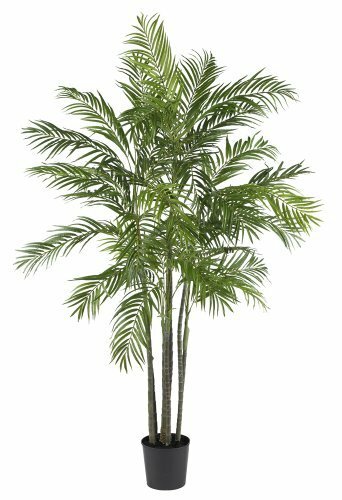 Some amazing looking trees that many enjoy are the artificial palm trees. Fake palm trees can add to the beauty of a home, combining with the architecture and furniture into an exotic, relaxing result. 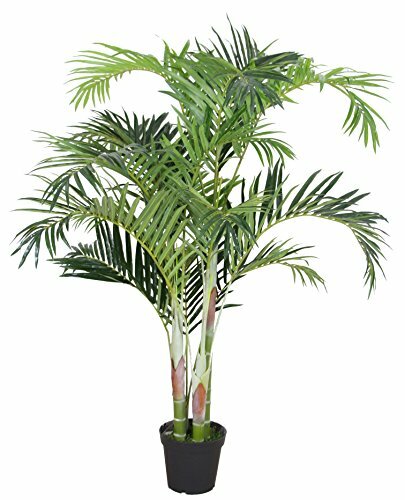 Now think how advantageous the artificial-plants technology becomes for you, if you wish to have a palm tree in your home! 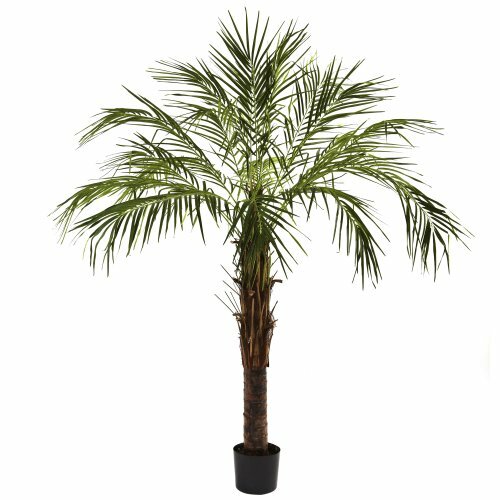 A real palm tree might never resist in the conditions of your home and lifestyle, due to special climate requirements (light, water, temperature), but an artificial palm tree will do just fine and will still look like a real one, fulfilling your dream of capturing the symbol of freedom in your own room! 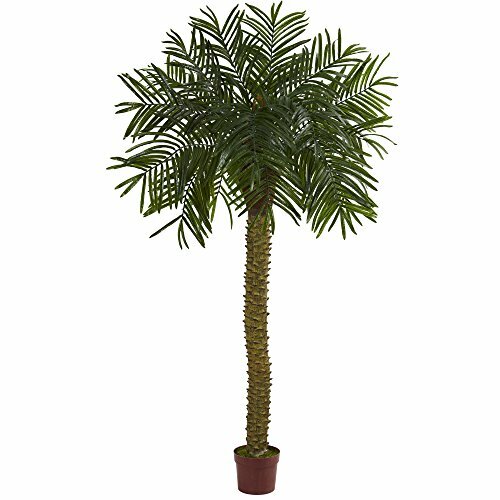 And because we know that you are also a lover of palm trees, and that the subject of faux indoor palm trees sounds as a real temptation to you, let's discuss a little more about the different, various types of fake palm trees! 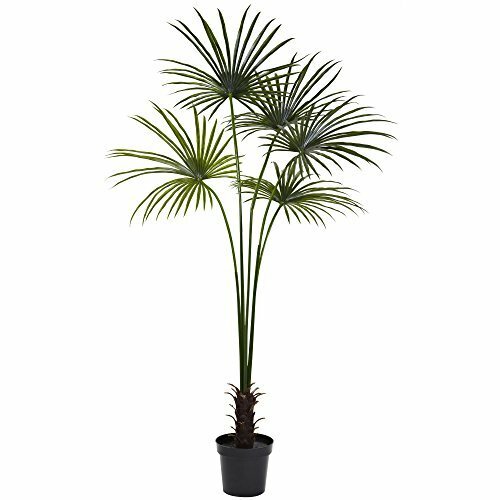 Some of them have large palm leaves, being able to create, just like a real palm tree, some shading for you when the sun beats in your home - creating the perfect place for you to read a book just like you would next to the sea, fulfilling your dream this way. 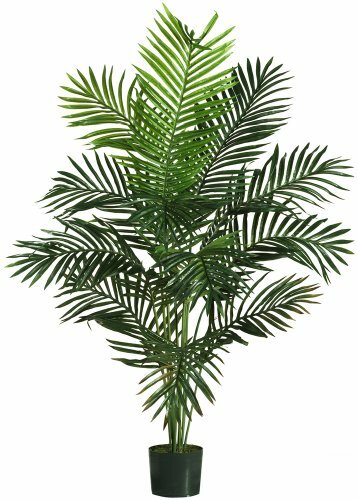 Other palm leaves are small and frequent, just like the exotic palm trees from the desert! Also, they are made in order to fit any home. 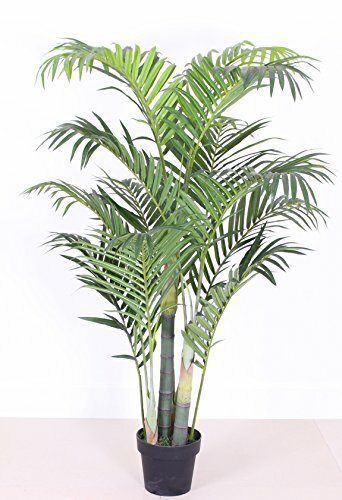 For example, while some artificial palm trees are made at small dimensions in order to fit any tiny home (such as the Nearly Natural Paradise Silk Palm Tree - 5ft tall or the Tabletop Faux Palm Tree In Pot - 1.5ft tall), others are very tall artificial trees, for big homes, and are upwards of 6-7 feet tall (for instance, Nearly Natural Golden Cane Silk Palm Tree - 7ft tall, or Nearly Natural Paradise Silk Palm Tree - 6.5ft tall). 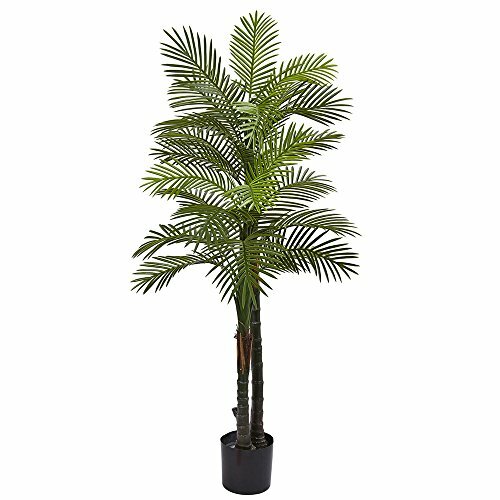 Therefore, there are lot of dimensions for indoor faux palm trees that you can choose from, on our website, in order to find the right one for your home! 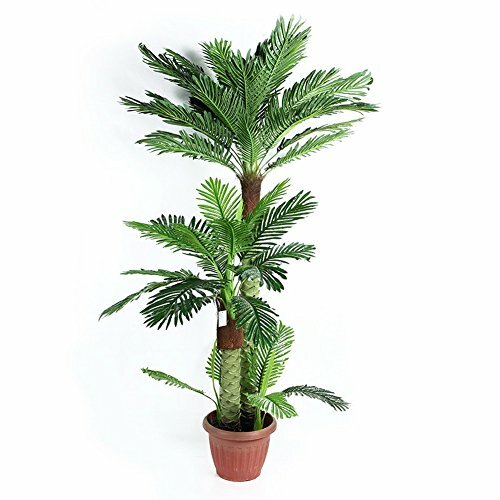 Yet, there is still some advice that you need before purchasing your palm tree, so make sure to follow this step because it is one that guarantees that your choice is right and you will be pleased with the palm-tree that will come into your home and which you will integrate in your living room, next to your bookcase, on your hall or in your kids' room. 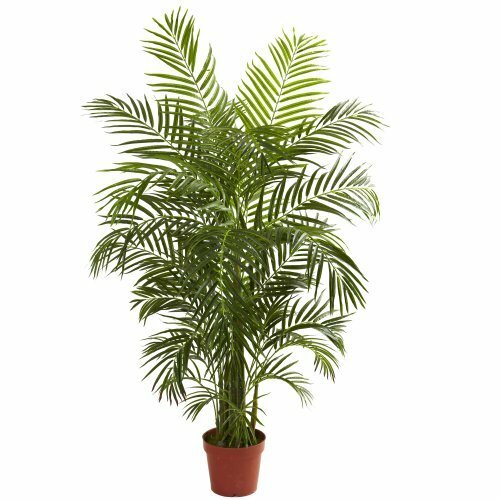 When looking for indoor artificial palm trees for your home, make sure that you read their descriptions carefully. Check the dimensions, the materials and other specifications. Notice that some come with pots and some don’t, and this is information that you can find out only by reading the description, not by simply looking at the photos. 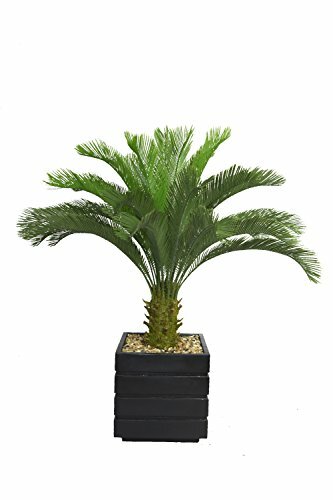 For example, it is clearly specified that the Nearly Natural Cycas Silk Plant has a plot included, but you can only understand from the description of the Nearly Natural Areca Palm Tree that it looks great with a planter and some decorative stones, but doesn't have one included. 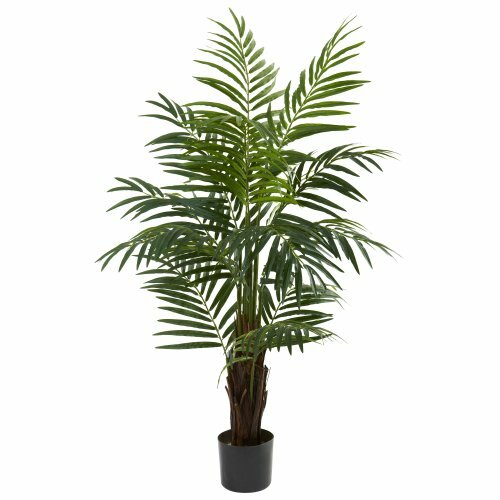 Another important point - and also good news for you - is that caring for fake indoor palm trees is relatively easy. The only aspects you need to care for are dust and light. 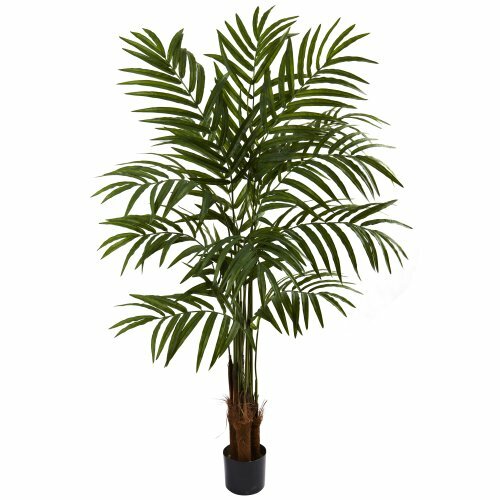 In order to prevent from dust storage on the leaves of your artificial palm trees, wipe them with a wet cloth once or twice a week and spray them with special substances for extra-shine and natural look. If you do so, there is small - almost inexistent - possibility for cobwebs to appear in your artificial tree; yet, if they do appear, make sure you remove them quickly. If you have pets, make sure you regularly remove their hair. 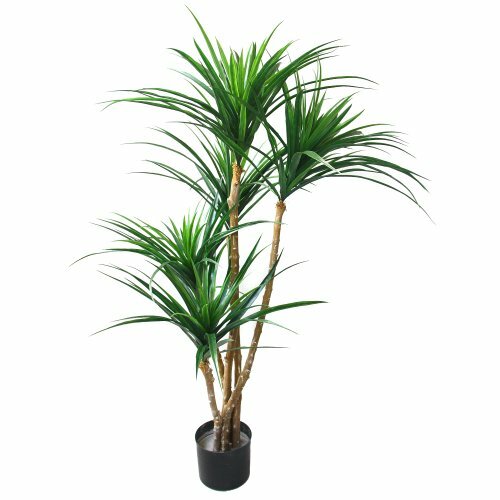 If you keep your artificial plant into the sunlight, make sure you rotate it once a week, so that the color won't fade due to light exposure. 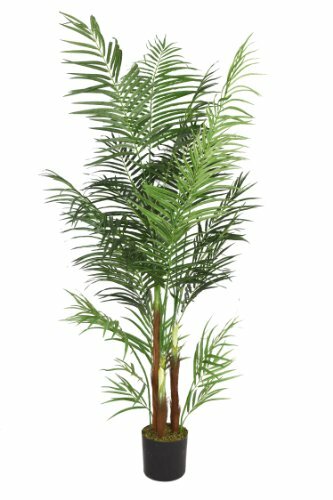 All these elements represent the care you have for your artificial palm tree and will contribute to its maintenance from the first day, when you settle it into your home. 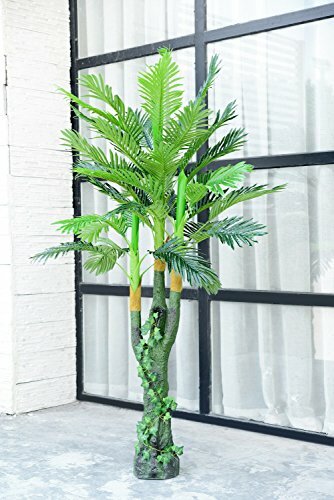 If you take proper care, then your fake palm tree will look natural and young forever! 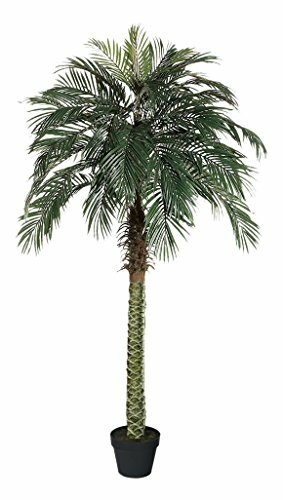 Extra Tip: If you choose a fake palm tree from silk, you should know that despite its more realistic, harmonious and touching look, the silk palm tree is also a little more difficult to clean than the plastic one. 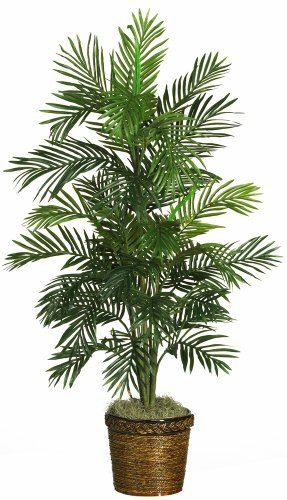 Apart from plastic, which with a splash of water hose gets immediately clean, the silk leaves of a fake palm tree require just a little bit of more attention. If they get really dirty, then you should cover up the pot that contains the tree with a plastic bag and then, with very small amount of water, carefully wash each leaf until everything is clean. Wipe the excess water off and then remove the plastic bag. That's it! Cleaning with plenty of water - like in the case of plastic - is not recommended for silk, because the adhesives and colorants used into the silk leaves might leak in combination with water. 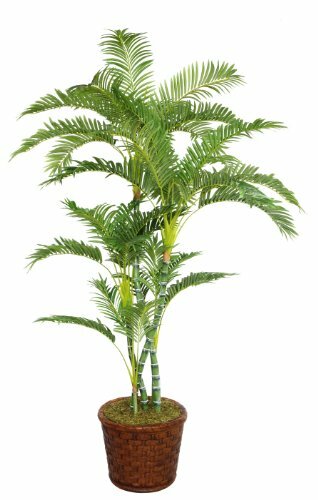 Therefore, avoid pouring water on your silk palm tree in order to stay away from the risk of changing its properties and appearance! ​In the end, you should choose what is best for you! Your home is your Universe of relaxation and good disposition. It is your source of positivity and productivity. It is where you get your energy and rest from. Therefore, the environment in your home should be just like you love it. 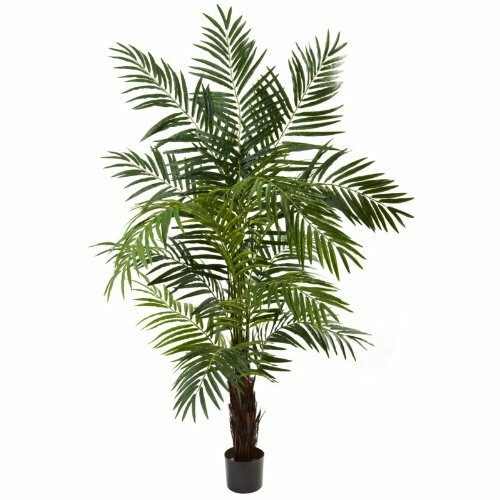 And if you love palm-trees or other plants, but you know you're not good at caring for them, the artificial plants and artificial trees might be the best solution for you! Therefore, start searching for the best artificial tree to fit in your home right now, from our website, where you will find plenty of your favorite versions of artificial trees!